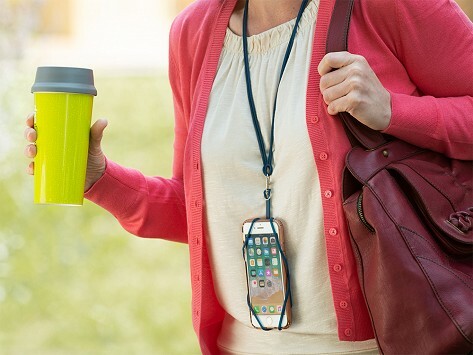 This silicone smartphone lanyard holds a phone (with a case) and keeps it accessible. Lightweight, flexible, and durable, the holder can be worn lanyard-style on your neck or detach it and hang it from your wrist or clip it to a bag or belt. Now your phone is within reach while your hands are free at festivals, sporting events, or when you’re spending time outdoors. Dimensions: 6.5" x 2.85" x 0.1"
I don't have to search in my handbag or pull the phone from my pocket anymoe. It's where I want it when I want it. What a joy! Makers Jonathan Magasanik, Joon Park, and RJ Theodore originally made this smartphone lanyard to keep phones safe, secure, and out of a snowbank for skiers riding the chairlift. The trio quickly realized the uses for Gear Beast went far beyond the slopes. The lightweight and flexible silicone lanyard holds a phone anytime you want your hands free but your phone handy, like at festivals, concerts, sporting events, or when you’re spending time outdoors. It’s also a great way for seniors to keep their phone accessible in case of emergencies. The silicone holder stretches to fit most phones—even ones with a case—and has space to hold credit cards or cash. Wear it lanyard-style around your neck, on your wrist, or clipped to a bag or belt loop. Now your phone is safe and right there when you need it.